Two vertical mount 8H-VC18 units were installed in the Colombian jungle on the river Caucasia, about 400 kilometers (248 miles) South of coast. Because of some interesting features, the installation earned the nickname the Green Dragon. 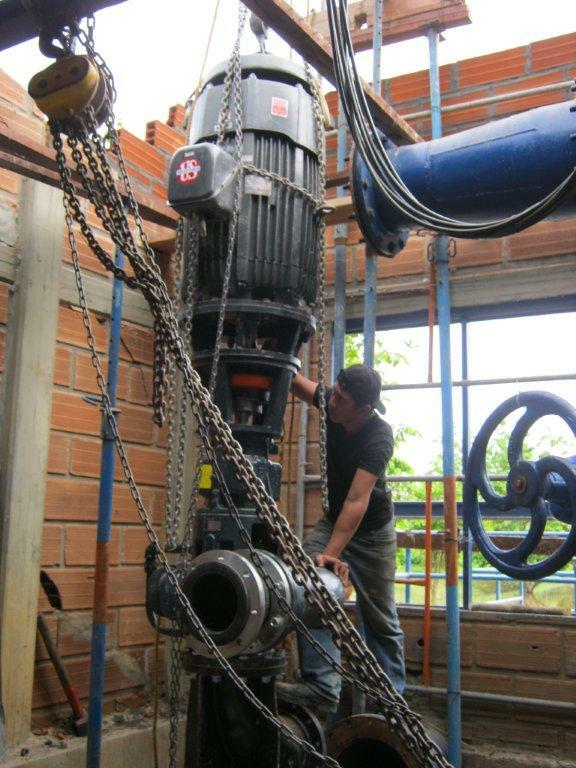 The pumps were designed in the vertical position in order to elevate the motors to avoid damage from flooding – a regular occurrence during the rainy season. The pumps replaced a locally manufactured brand, IHM. The pumps were put in series, to overcome a relatively high pressure requirement due to a 1.5 kilometer (~1 mile) distance of piping to a local village. The pumped river water is being used to supply the village with fresh treated water for personal consumption. Due to the Rain-a-flo blue paint color (which actually looks green) and the exotic discharge and suction piping design, the locals named the pump installation the Green Dragon. The logistics required to get the equipment to the job site was interesting in itself. The crew employed traditional banana boats to transport pumps, motors, pipes, etc., across the river to the pump house. Once the equipment arrived, a system of wooden rails and rollers were used to move the pumps and motors along the ground and in some cases, sloped gradients. Ropes and block and tackle apparatus were used to do a lot of the heavy lifting, as no powered cranes were available. Pump house modification was also required, as the crew removed a large portion of the roof to accommodate the vertical installation and the discharge piping—the snoot of the Green Dragon. It was an incredible feat of local ingenuity to make this a successful installation; relying solely on manual labor, determination, and brute strength. 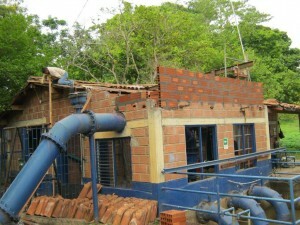 The pumps have been successfully in operation since 2010, supplying clean drinking water to the village. 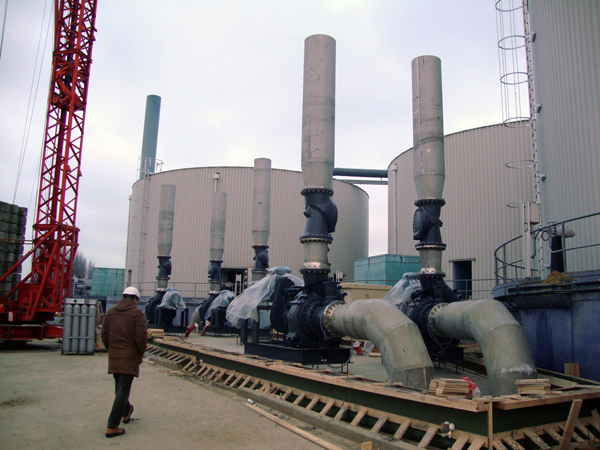 Two major waste water treatment plants in Brussels faced issues with sludge circulation in the decanting basins; use of the previously installed pumps was creating too much foam, leading to sludge particles floating near and on top of the water’s surface. Because the sludge was not settling down into the basins as expected, the extraction process was not as effective as designed, and the pumps were using more energy than anticipated to operate. The plants manager wanted a change to efficiency; that desire led to a change in extraction strategy. To alleviate the problem of the excessive foam, it was decided to pump sludge from lower tanks to higher tanks with Cornell Self-Priming pumps. 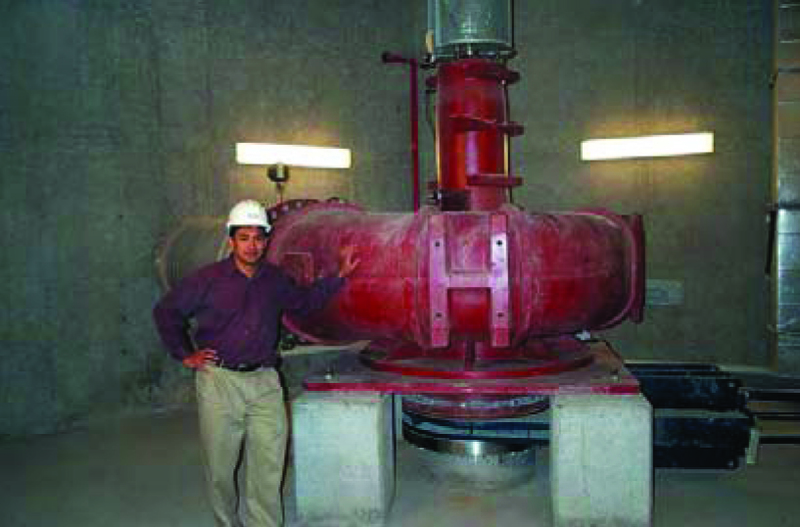 These innovative Cornell pumps helped remove the excess air from the sludge before it was pumped into the upper tanks and comes into contact with the surface mixers. Cornell’s self-priming pumps aided in the removal of air bubbles that were trapped in the water. At certain times observers could hear the vacuum pumps extracting the air that had already been separated from the water by turbulence. 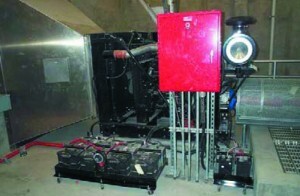 Under those conditions, pumps without self-priming capabilities would lose their prime because of the excess air. 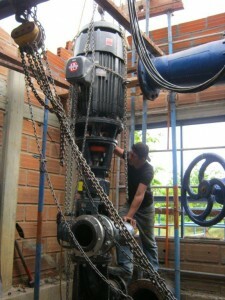 In the previous pumps that had been an issue; an issue that was solved beautifully by using Cornell self-priming pumps. The installed Cornell pumps have two functions at the plant: initial priming at start-up and extracting the excess air during the pumping process. 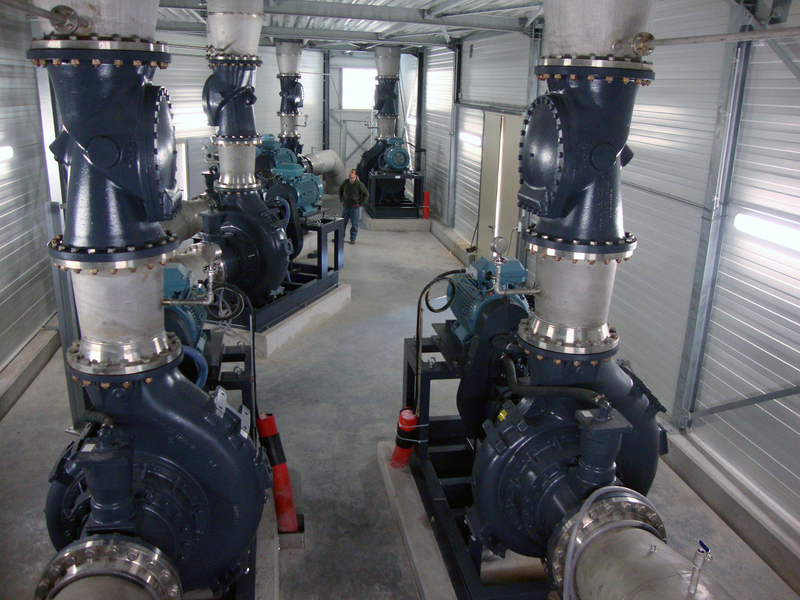 These pumps are driven by 90kW electric motors and are controlled by variable frequency drives that operate between 400 RPM and 600 RPM at the pump shaft. The maximum hydraulic efficiency of the pumps is 87.3%! Six Cornell 18NHFL pumps have been working effectively at the Brussels plants since February 2011. 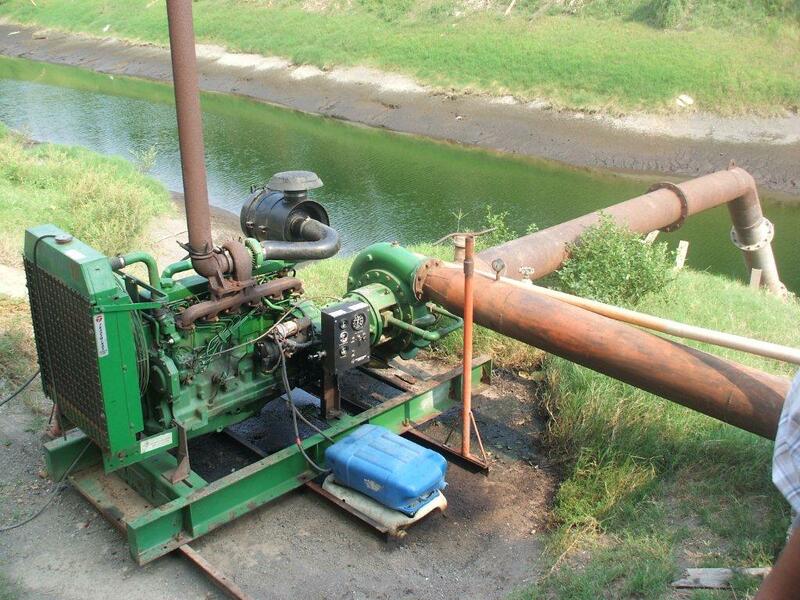 When a large Guatemalan sugar cane producer was looking to purchase numerous diesel driven pumps, Cornell proved that efficiency does matter. A US-based engine packager was asked to provide a quote on ten (10) diesel pump packages capable of hitting a design point of 800 GPM at 280’ TDH. Cornell’s best selection was a 4HH-F16 capable of hitting the design condition at 1920 RPM with an efficiency of 84%. A local company was offering a competitor capable of hitting the design condition at 1800 RPM but with an efficiency of only 68%. Cornell met with the end user in Guatemala to debunk their misconception that a diesel engine burns less diesel fuel and lasts longer if runs at 1800 RPM. Equipped with pump curves on both pumps, an engine performance curve on the Deere engine, and a fuel consumption comparison chart, Cornell was able to inform the customer. Just as pumps have various RPM performance curves which show flow and head at a given RPM; diesel engines also have performance curves which show Hp, torque and fuel consumption at a given RPM. There are a lot of similarities to the curves. The main similarity is that both the engine and pump have gradually sloping curves. In terms of the engine it usually means that the best fuel consumption is not a defined point (RPM), but rather best fuel consumption covers a range of RPM’s. With the engine performance curve, we able to show the end user that max fuel consumption was almost the same in terms of pounds of fuel per Hp per hour at 1800 RPM as it was at 1920 RPM. The difference in fuel consumption was actually found in the pump performance. The end user had contracted fuel for the upcoming season at $4.50 per gallon; based on past experience, they anticipated 1900 hours of run time for the season per pump. After calculating Hp required for each pump, fuel consumption, fuel price and estimated seasonal usage, Cornell saved the end user around $2,800.00 per pump in fuel savings per season. That equates to over $28,200 per year savings for the (10) pumps. 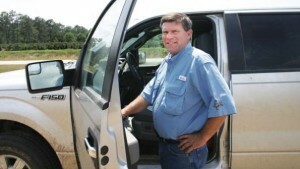 “I’ve been farming since 1983, and last year was the most perfect year for weather I’ve seen, says Tim McMillan, who along with his brother Steve owns and operates Southern Grace Farms in south Georgia’s Berrien County. “Efficient By Design” is more than just a slogan at Cornell. It is a standard to which we hold ourselves. Cornell is the most efficient pump line on the market. With production costs increasing, cultivatable land decreasing, and world populations increasing; the US farmer has to produce more with less to stay successful. Our high efficient pump ends help farmers reduce power consumption and put more profits to the bottom line. 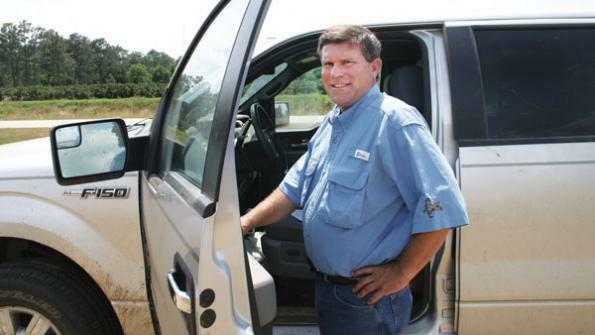 Seventh generation farmers Tim and Steve McMillan were awarded the Lower Southeast Farm Press Peanut Profitability Award for 2013. The Peanut Profitability Award is based on overall efficiency in producing a crop. This involves keeping input and overhead costs as low as possible. The McMillans produce cotton, peanuts, and corn as traditional row crops. They also operate two “you-pick” locations offering strawberries, blackberries, nectarines, and peaches. The McMillans yielded an impressive 5,991 pounds of peanuts per acre in 2012 from their irrigated crop. Approximately 40% percent of his crop is irrigated under center pivot, while 20% is irrigated with cable tow machines. The McMillan’s purchased their first Cornell pump (3WH) from Cornell’s Nashville dealer in 2011. 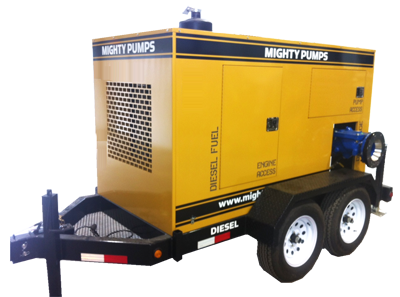 The 3WH has head up to 25’ and flow up to 760 GPM, boasts an 81% efficiency, and is part of our extensive line of agricultural pumps. Congratulations to the McMillans and Southern Grace Farms. New Pump features 7,000 GPM, 625’ of head, and 82 Percent Efficiency! As oil companies push to establish more wells for increased US production, the demand moves toward more flows and higher pressure to maintain adequate water supply at multiple hydraulic fracturing sites. Often companies are limited by pipe size, since they have lay the pipe out on top of the ground at the start of the job, and then take it up after the job is complete. As new pipe and hose hit the market carrying higher pressure ratings, companies continue to try to push more water through the same size pipe. Earlier this year one of our Texas based OEM’s was approached with an application which required 4,500+ GPM at over 500’ TDH. This design condition hit right in between two our larger pumps that we regularly sell into the water transfer/oil field market. Our 6822MX can easily hit the head, but cannot quite hit the max flow. Our 8NHTH would easily hit the max flow but would fall well short on head. The only pump that we had capable of doing the job was our 81026MX pump which released late last year. The HP required to drive this pump coupled with its sheer size made this pump impractical for this particular application. Cornell’s Solution: After an extensive R&D process, Cornell now has a new pump model that exceeds the customer’s expectations. The 8NHG19 is a high flow, high head, and high efficiency pump. 4HC Redi-Prime® Engine Mount 18DB-3 pump serve as heart of firefighting equipment in oil refinery. After a devastating flood on the Maleh river, a Mohammedia, Morocco based oil refinery had more than brackish water to clean up—the ensuing flood had sparked a serious fire in the refinery’s storage area. Shaken by the devastation, the refinery set about creating an emergency fire wagon that could be rapidly deployed to fight fires, as well as used in dewatering. 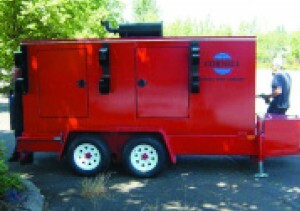 To accomplish this dual purpose, a Cornell 4HC Redi-Prime® Engine Mount 18DB-3 pump was coupled with a Cummins engine, and placed on a trailer. Painted a bright ‘fire-engine” red, the pumps stand out. Able to be rapidly moved around the facility, the pumps could easily move thousands of gallons of water per minute to combat a potential devastating fire. Using the attached hoses and system, the pumps can also serve as dewatering pumps should the storage area again be inundated by flooding. The refinery is producing more than 125,000 barrels of oil per day, and looking to expand. Having several of the 4HC pumps outfited to fight fires, helps them more effectively meet the risk concerns of the plant. 4NHTA-F18 Duplex Pump is Special Made for SoCal Sewer Lift Station Project. 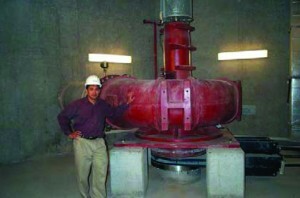 Cornell produces thousands of pumps per year—and many have special features or design components. Cornell is happy to supply our distributors and customers these custom built solutions—it’s part of our customer service philosophy. A Southern California distributor had just such a special request. 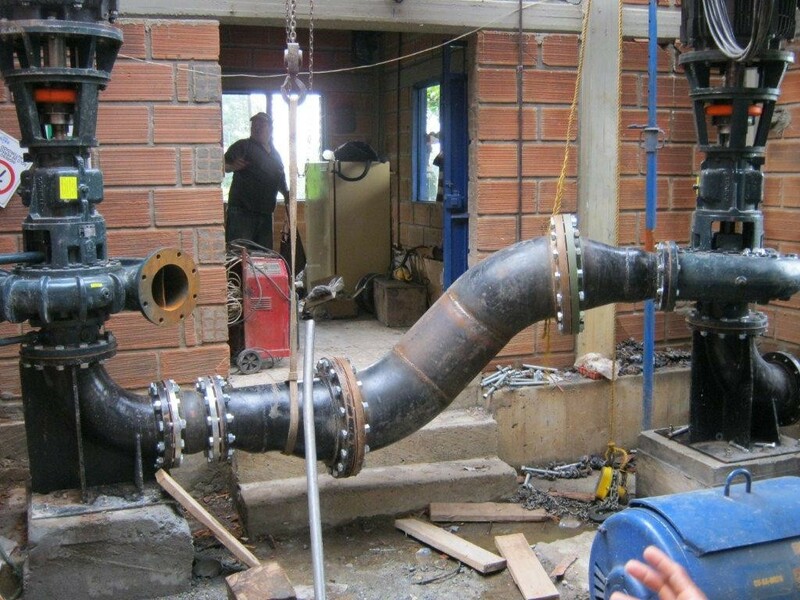 They required a horizontal duplex-tandem pump with 4“ piping for a sewer lift station on the coast. The centerline single volutes, suction covers, backplates, and impellers all had to be ductile iron to deal with high pressures and abrasive waste water. The installation also required a specified inverter duty to allow the motor to run at different speeds and a double extended steel shaft. 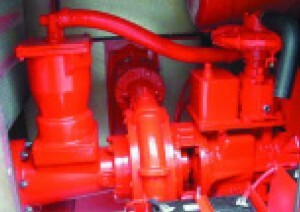 The 4NHTA-F18 duplex pump was powered by 75 Horsepower motor. The total pump weighed more than 2,400 lbs—quite heavy for a 4 inch pump, and required a specially designed and built skid to support it. Custom work like these is a forte of Cornell Pump Company. We can use our experience in other installations to find unique solutions—as well as provided tried and true standard products from 1.25” to 30” discharges. The winters can be brutal in British Columbia, especially at 7000 feet up a mountain. 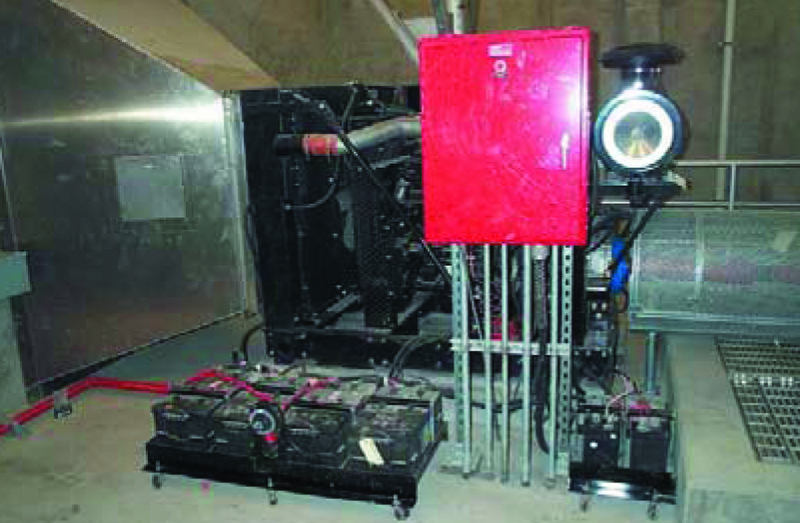 A BC-based coal company had a problem with dewatering, and needed Canada Pump and Power to provide powerful pumps—QUICKLY! Even with the remote location 746 miles (1,200 Kilometers) from BC’s main coastal cities, Canada Pump and Power was able to rush pumps to the mine location and begin pumping 7.39 million gallons per day (33,600 cubic meters of water per day) within 36 hours of receiving the emergency call for pumps. 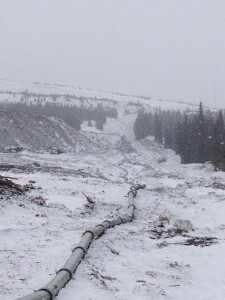 The distributor laid over 7,000 feet of Bauer pipeline by hand to transport the liquid away from the mine site to a holding area. Two Cornell 6NHTA pumps working in tandem were able to address the issue of flooding. 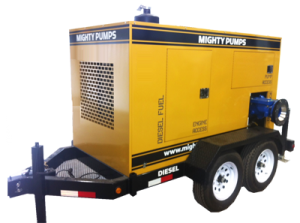 The 6NHTA has up to 300’ (91m) of head, and pumps up to 3,130 gallons per minute (11,860 liters per minute), has a 8” suction and 6” discharge, features a two vane enclosed impeller, handles solids up to 3” (9cm) in diameter. 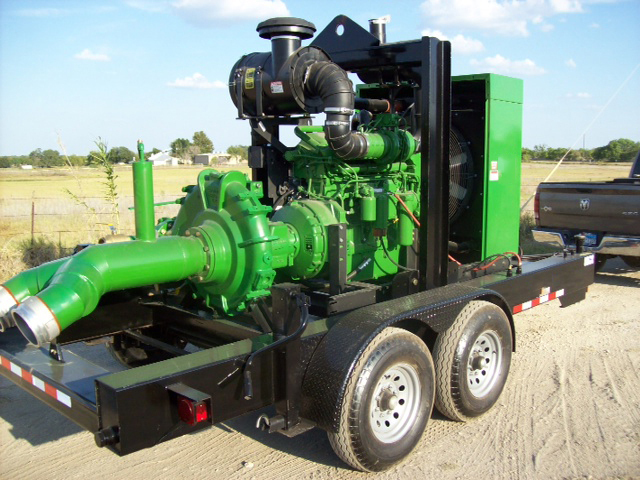 Canada Pump and Power built the 6NHTA onto a high performance trailer package, which runs at 2,000 RPM with a Cat C4.4 continuous electronic engine operating at 142 HP. Once they had received the emergency call, the distributor transferred the pumps from an Alberta staging yard to the site. Cornell is able to address pumping needs from the bitterly cold northern British Columbia to tropical sub-Saharan Africa because of our quality pumps melded with great distributors like Canada Pump and Power. A city in northern California wanted to install a brand new reclamation system to be in compliance with state requirements. Building a new facility, rather than simply adding a pump into an existing system allowed them to consider numerous manufacturers. Cornell competed against three other well-known manufacturers. When the design engineer firm looked at performance, with the pump designed to flow at 24,300 GPM at 38 ft of TDH, the Cornell 30NNt-VF30 came out on top. Paired with 30NNT-VF30 was a vertical Johnson Power line-shafting, a De’Ran right angle gear drive, horizontal Johnson Power line shafting, and a Cummins 360 HP diesel engine. Cornell also supplied a Murcal control system, Tramont double-walled fuel day tank, battery racks, batteries, chargers, and components for the stainless steel exhaust system. The system was put through extensive review in Cornell’s test lab, as well as undergoing a rotor dynamic analysis of the entire drive train, anchor bolt, and seismic design calculations, and field vibration tests. All work went off without a hitch, and the system has operated successfully for more than two years. A Gulf Coast based pump supplier of Cornell, one of the leading suppliers to the shale fracturing industry, had a customer that faced piping hydraulic fracturing water transfer with multiple pumps. New Cornell pumps helped pump more efficiently with lower fuel costs. The company operated six miles of twin 8” pipeline with 100’ of positive elevation change over the length of the pipeline. To supply the water, the company needed to pump 100 barrels of water per minute (4200 GPM) through the pipeline. The water transfer company had nine 6NHTB’s on site to do the job. Three of the 6NHTB’s were sitting at the water source as the supply pumps. Spaced along the twin 8” pipelines were six more 6NHTB’s at various intervals to boost the pressure. This required significantly more labor to initially set, maintain and monitor nine pumps than the solution pumps. After Cornell and the dealer analyzed the specifications for the system, a option was recommend that cut the number of pumps needed to three. The solution was to place an 8NHTH at the water as a supply pump and to place one 6822MX on each 8” pipeline as booster pumps. Not only did this cut the number of pumps by two thirds, but it also drastically reduced diesel fuel consumption on the project. 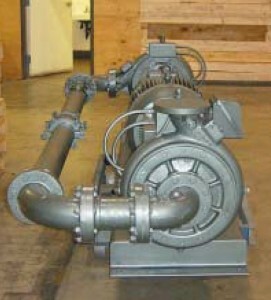 The 6822MX is part of Cornell’s high head “MX” line of mining pumps that was first introduced 2010. The “MX” line of pumps boasts industry-leading performance with flows up to 8,000 GPM and heads up to 800’ TDH. They are available in 2” to 8” discharge charge sizes and include ductile iron castings with CA6NM impellers. While the 8NHTH is not a new pump for Cornell, it is relatively new to the oilfields. It is a 10X8 pump that boasts a maximum 20.50” impeller with a max flow of 8400 GPM and a shutoff head of 460’. This impressively solid pump has wide flow range with excellent efficiencies. Since being introduced into the oilfields by the supplier in 2011, the “MX” pumps and the 8NHTH have substantially changed the way many of these difficult projects are approached. It is no longer necessary to stack large numbers of pumps to do long pipe runs or drastic elevation changes. These pumps have become staples of many oilfield companies’ product offerings.